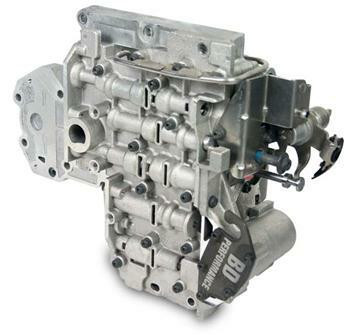 BD Diesel Valve Bodies - Dezod Motorsports Inc - Home of the automotive performance enthusiast since 2002. An economical way to improve the performance and clutch life of your stock transmission is to install a BD Performance Valve Body. Our complete upgrade of the stock valve body consists of new valve designs, increased capacity springs, revised oil circuits and optimized governor piston dimensions which the improved oil flow reduces temperatures and lowers torque converter evacuation time for quicker clutch apply. BD’s design achieves up to 80% higher clutch apply pressures over the stock unit and up to 50% over the competitors with the increase starting at much lower engine rpm’s and at lighter throttle pedal position movement. Light throttle shift firmness is also maintained at these higher apply pressures. This building process also eliminates the often referred to “Shuttle Shifting” or hunting-for-gears in the 2004-2006 48RE transmissions. For exhaust brake usage, the higher pressures achieved by BD Valve Bodies help assist in preventing convertor lock-up clutch slippage. Second gear lock-up capability has also been added that along with the addition of one of our TorqLoc or AutoLoc kits, you can get some serious engine retarding capability on towing applications. Each valve body is tested to ensure proper function before shipping. While you’re replacing the valve body, add one of our heavy duty aluminum oil pans for greater oil capacity, cooler oil temperature and improved case rigidity.